Swamp roses, rosa palustris, are commonly found on the edge of a pond, lake or in other wet areas. It produces beautiful double pink blossoms in the spring. It grows wild and needs very little care. Prune swamp roses to remove dead wood and keep the plant healthy. Top the whole plant once every five years. 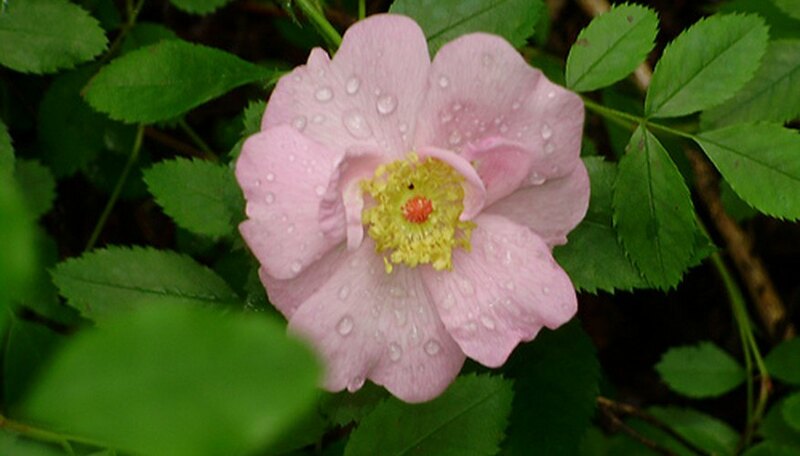 These steps will help to protect your swamp rose and keep it healthy. Prune your swamp roses when they are dormant. In areas where roses do not go completely dormant, wait until winter when they are not actively growing. Use pruning shears to remove dead wood. Cut away all damaged, diseased or scarred canes. Any branch that looks dry, shriveled, dead or black needs to go as well. Cut the canes flush to the bud union when removing an entire cane or branch. Short stubs will die and allow disease and pests to take hold. Cut swamp rose canes close to a leaf bud, just above the bud, when trimming the cane. Make clean cuts using pruning shears on small canes and a saw on larger canes, if needed. Always prune back to a healthy bud. Make you cut at a 45-degree angle, slanting away from the bud. Examine the cut. If the interior of the cane is brown, cut again, removing more wood until the wood inside the cut is white with no trace of brown. Coat cut ends with a sealing compound. This will protect the cut from diseases and pests. Remove canes that cross through the center of the swamp rose or rub against other canes. This will open up the rose and gently shape it. Examine the remaining canes. You should have only healthy green canes left. Clean away all debris under and around your swamp rose. Remove dead leaves and trimmings. Remove trapped leaves and debris from the interior of the plant. Rake the area clean beneath the plant. Remove dead roses during the growing season, if desired. This is a matter of preference. Flowers that are not removed will develop into swamp rose hips that are attractive in their own way. Cut the swamp rose back completely every five years. Cut each stem back, leaving approximately 1/3 of its original length. Follow the pruning advice above about where and how to cut each cane. This moderate prune allows the plant to re-establish itself and rejuvenates the plant.